My brother in law, Solomon Aragay, is the manager of the Dembe Sembel School, located in the Corea Housing Complex. Good reason to visit him at his work, and the school, I guess. I am just in time to witness the early morning ceremony: the hoisting of the Eritrean flag, while the students sing the Eritrean nation anthem. I talk with Solomon about the statements of the Security Council in the last weeks in relation to the border conflict. Threatening Eritrea (that banned UNMEE helicopter flights) with sanctions, while giving Ethiopia (unwilling to implement the EEBC rulings and violating the Algiers Peace Agreement *) just a warning. "It is clear that the Security Council has double standards, and is biased in favor of Ethiopia", Solomon argues. A new war may very well be an instrument to divert the prevailing internal crisis in Ethiopia (popular uprisings in various parts of the Ethiopian Federation), lurking for a motive to invade Eritrea. Challenging Eritrea, warmongering and threatening with war, drawing away attention from the current crisis in Ethiopia. If the Ethiopian government isn't willing to invest in its people, but is investing in military hardware instead, why should we give them economic assistance? Indirect military aid to Ethiopia should be stopped. The UN stated explicitly that the two countries should solve their problem themselves. How, if the binding conclusions are not binding at all? How if the the UN is to weak to fulfill its mandate to demarcate the border? The Eritrean stand on the Eritrean-Ethiopian border issue is both legal and moral, while Ethiopia is obstructing and frustrating the operations of the Boundary Commission and still occupying Eritrean territory. 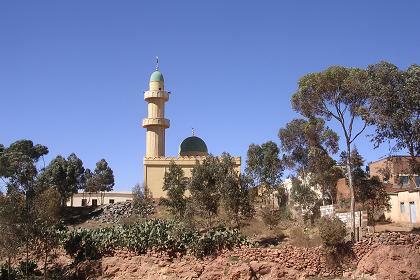 On my way to Edaga Arbi, where I will visit the sister of Mebrat, I pass Acria, a district in the northern outskirts of Asmara. 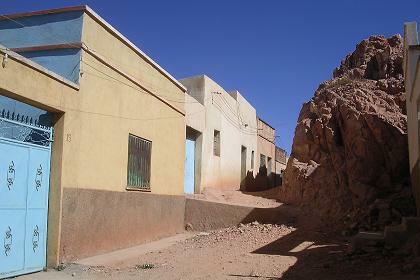 Streets following the waves of the escarpment on which it is build. Stairs hewn out of the red rocks. A giant rock half blocking a street. After my family visits, I have an appointment at 15:00 in Gejeret. 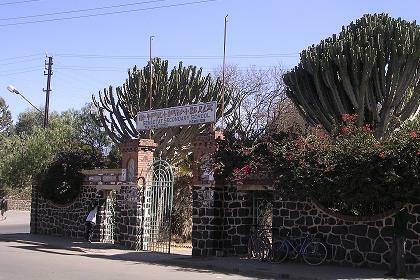 I pass the Semaetat Secondary School, with its beautiful entrance, decorated with giant cacti. The school is one of the buildings on the CARP map, registered under interesting architecture from 1952 onwards. When I point my camera on the entrance, two guards are shouting in my direction. With my back almost against the wall of the US embassy pointing my camera in the direction of the schools entrance, the guards tell me it is forbidden to make pictures, pointing at a sign on a wall around the embassy. "I am not picturing the embassy, but the school on the other side of the street! ", I respond irritated. "It is forbidden to make pictures here", they repeat. I ask the guards if I have a word with the ambassador himself, to explain why I cannot picture the school on the opposite side of the street. When they ignore my question, I walk away, and make my picture of the school, ignoring their warnings not to make pictures. I start a discussion with the guards, asking them who's rules it is not to make pictures, US embassy regulations, or regulations of the Eritrean authorities. No answer. "Is there anybody inside the embassy, who is willing to explain this kind of behavior?" I ask them. The guard tells me there may be a bomb in my camera. I try to explain that tourists make pictures and terrorists leave their bag and run, or hide explosives under their coat. "Do I look like a terrorist?" I challenge them. One of the guards realizes the nonsense of their exaggerated diligence and diverts the conversation to another subject. Two Asmara policemen sitting next to the guards are observing the situation, but remain silent. Hoisting of the flag and singing the national anthem. 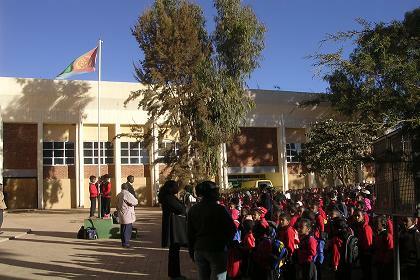 Dembe Sembel School - Asmara Eritrea. 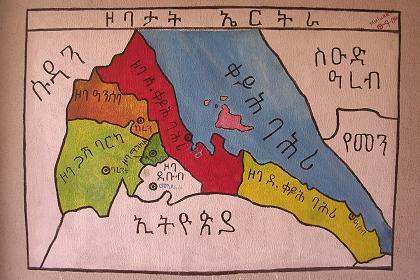 Map of Eritrea. Dembe Sembel School - Asmara Eritrea. Scenic view on Sembel from one of the windows of the school. 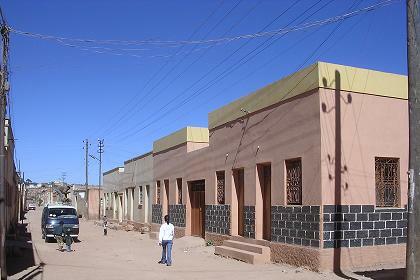 Streets of Akria - Asmara Eritrea. Se'alena (picture us). 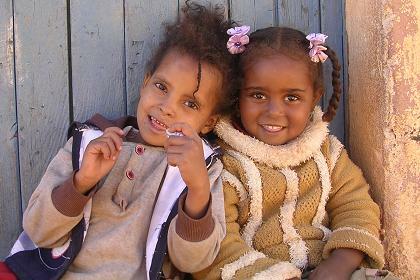 Children in Akria Asmara Eritrea. Bus terminal. 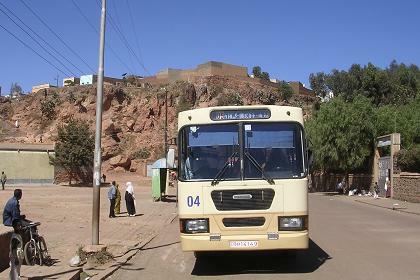 Akria Asmara Eritrea. (Or is the school an object within the US National Park in Asmara?). 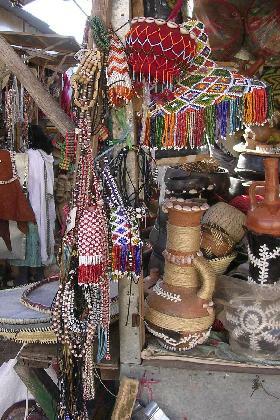 Souvenirs at the market. 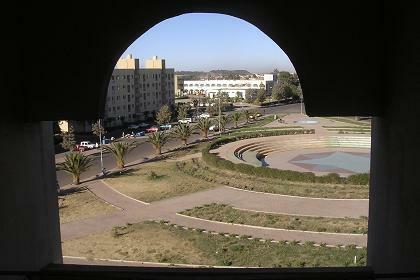 Asmara Eritrea. *) December 12, 2000 Eritrea and Ethiopia signed a peace agreement in Algiers, after a 2 1/2-year border war. Article 4, sub article 15 reads as follows: “The parties agree that the delimitation and demarcation of the Commission shall be final and binding. Each party shall respect the border so determined as well as territorial integrity and sovereignty of the other party”. On April 13th 2002 the Permanent Court of Arbitration in The Hague published the conclusions of the Eritrea-Ethiopia Boundary Commission. In September 2003 Ethiopia's Prime Minister, Meles Zenawi, formally informed the Security Council that Ethiopia rejected the decisions of the International Boundary Commission (arbitration of the International Court in the Hague). He declared the proposed 1 000 km international border drafted by the commission as "null and void". This disrespect of Ethiopia for the decisions of the Court of Justice in The Hague has practically halted the peace process. Still the UN needs to live up to its responsibility of ensuring the implementation of the final and binding resolution of the Eritrea-Ethiopia Boundary Commission's ruling on border delimitation.